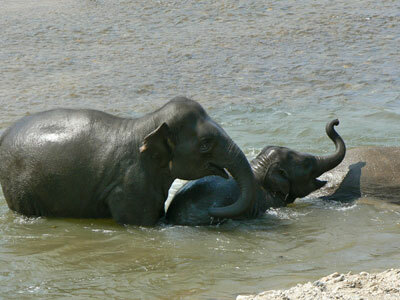 We were picked up by a minibus of the Elephant Nature Park (ENP) after breakfast. Amy and Dave from the UK completed our small group, and on the one and a half hours' drive we watched a DVD about the park and its goals. There are mostly orphaned and injured elephants in the park, and they also free working elephants from bad labour conditions. 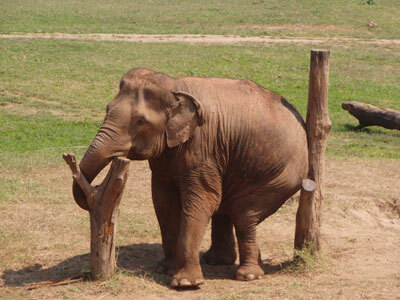 In the now mostly illegal logging industry elephants are often drugged with amphetamines to be able to work even harder and without pause. At the moment there are 35 elephants in the park, forming small groups of two and three and also one family group with the two youngest (both about 2 years old) and their mothers, siblings and (step-)aunts. 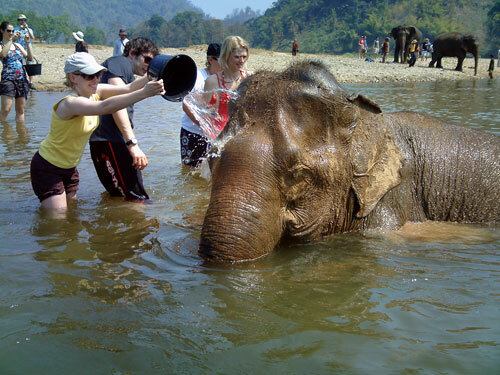 The visitors' program includes "only" feeding and bathing the elephants. 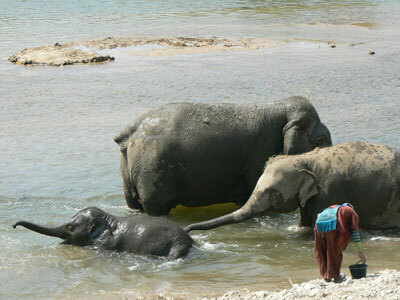 There is no elephant riding (actually an elephant can carry on its back no more than 100 kg for a longer period without suffering permanent damage) and there are no shows with dancing, painting or other abuse. 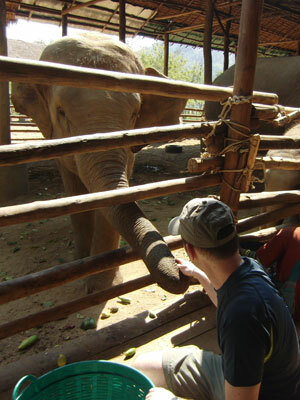 Part of the program is also a film showing the cruel breaking-in ritual every young working elephant has to suffer. 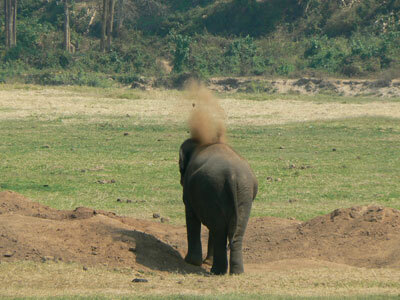 At the age of about two years the elephant is separated from his mother and caged in a wooden frame. 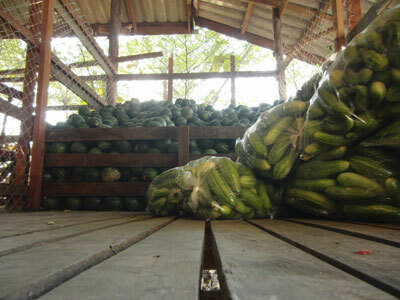 With beatings, sleep-, food- and water-deprivation the animal's will is slowly broken - this can last 4 to 7 days. The agonized eyes of the weakened and injured animal left a lasting impression on us. 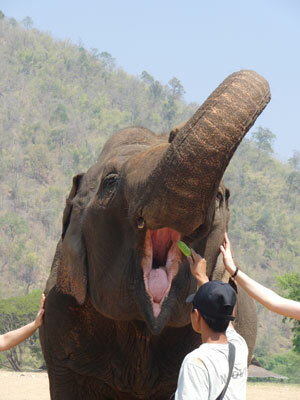 At the ENP training is exclusively done by positive reinforcement as now common in e.g. dog training all over the world. 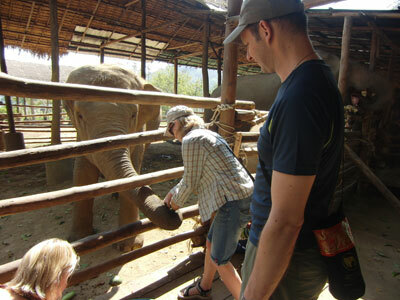 After our arrival at the park we walked around with our guide Olive and visited our first group of elephants. Later we continued with the feeding and after that we had lunch with the day visitors and the volunteers, who stay from a few days to several weeks. 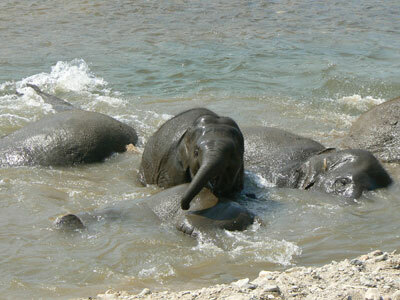 After lunch followed the bathing of the elephants and after that the aforementioned film. When the baby family arrived at the river all visitors had to go to the skywalk for security reasons. 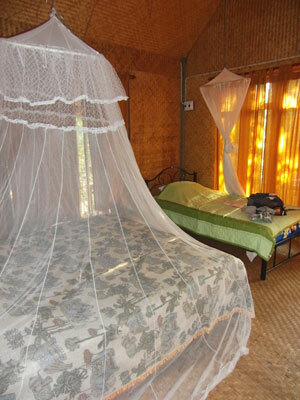 Later in the afternoon the day visitors departed and we moved in to our bungalows. 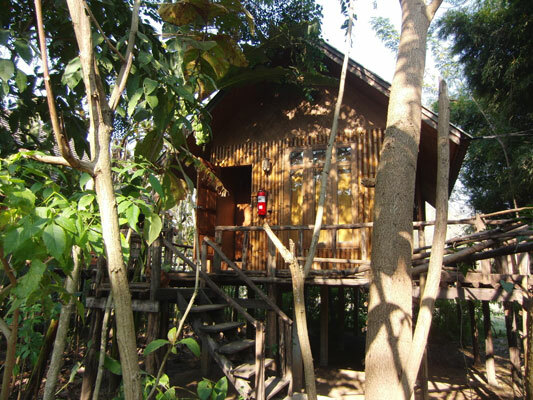 The bungalow was spacious and we had a nice view from the semi-detached bathroom.